The Gold-Silver Ratio has been one of the most reliable technical ‘buy’ indicators for Silver, whenever the ratio climbs above 80. The Big Q: Is the current spike in the gold/silver ratio forecasting another stock market crash? The gold-to-silver ratio has moves above 85, which is the highest mark of this 18-year Bull market. We have to go back 27 years to Y 1991 for the ratio to be higher than it is now. Notably, the ratio is currently higher than it was at the depths of the Ys 2008-09 financial crisis. The gold-to-silver ratio is a powerful trading signal that can help to identify buying or selling opportunities in the precious metals sector. The ratio represents the number of silver ounces it takes to buy a single ounce of gold. Sound simple, Yes? but this indicator is more powerful than it looks at 1st. The ratio of silver to gold in the earth’s crust is 17.5:1. In ancient times, the price ratio was set at 12 to 1. In Y 1792, the gold/silver price ratio was fixed by law in the United States at 15:1, which meant that 1 toz of gold was worth 15 toz of silver; a ratio of 15.5:1 was enacted in France in Y 1803. The average gold/silver price ratio during the 20th Century, however, was 47:1. Over the past 20 years, the ratio has averaged right around 60:1. So, the current ratio of 85 is very high historically and nearly 60% above the 20-year average. The ratio is signaling that silver is extremely undervalued relative to gold now. The all-time high for the gold-to-silver ratio occurred in February of Y 1991, at the height of an economic Recession. The Recession of the early 1990’s lasted from July 1990 to March 1991 and was driven by a restrictive monetary policy and Iraq’s invasion of Kuwait in the Summer of 1990. The latter drove up the world price of Crude Oil, decreased consumer confidence, and exacerbated the downturn that was already underway. 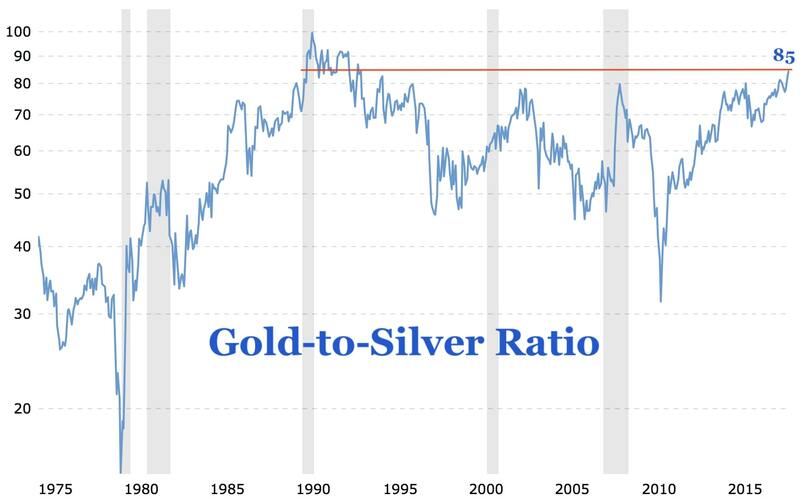 Take a look at the historical chart for the gold-to-silver ratio for perspective on just how high it is today at 85. In the past, the gold-to-silver ratio spiked higher during times of economic instability or Recession. This makes sense as gold is generally viewed more strongly as a safe-haven asset than silver and institutional investors move funds primarily to gold, or USDs for safety. Furthermore, nearly 50% of silver’s demand is industrial, so economic contraction would impact the price more severely. The silver price falling more rapidly than the gold price or climbing more slowly than the gold price increases the ratio. Put simply, it takes an increasing number of silver ounces to buy a single ounce of gold during these frames. Yet, the current gold-to-silver spike is happening absent a major crisis, as economic growth picks up and major stock indices hit new all-time highs the current gold-to-silver spike is happening absent a major crisis, as economic growth picks up and major stock indices hit new all-time highs. It looks a little reminiscent of the period from Ys 1982 to 1987, leading up to the Black Monday in October stock market crash. The ratio also rose from Ys 1988 to 1990, again leading into a major stock market correction. The ratio typically spikes to extreme levels during the depths of an economic crisis or leading up to a significant correction in the US stock markets. The US stock market is currently very robust and enjoying a 9-yr+ Bull market with gains in excess of 300% for the S&P 500 and 400% for the NAS Comp. The spike is not driven by a crisis that already exists, increasing the odds that we are approaching a correction in the US stock markets. Begging the Question: Why else would investors be favoring gold so strongly over silver during a time of healthy economic growth? The fundamental supply and demand numbers do not support gold’s outperformance Vs silver. Gold demand fell by 7% in Y 2017, while silver demand fell 2%. Supply for both gold and silver fell 4% in Y 2017, according to estimates by the World Gold Council and Silver Institute. The experts are saying that it is hard to know for sure if the gold/silver ratio has peaked, but some are taking advantage of the low silver prices in herre. The US Mint Sold 1,530,000 American Silver Eagles in August, the most in a single month since Y 2015, as the demand has been so strong that the US Mint recently reported that they have sold out of 2018 American Silver Eagles. Silver is currently very undervalued relative to gold, and his sets up an opportunity to buy silver and sell gold, potentially via a pair trade using the highly liquid gold and silver ETFs (GLD, SLV).